The Columbian capital is quite an active spot with tweeters. In general the twitter platform is very popular in South America and Bogota is no exemption. However it is in terms of overall numbers behind fanatic tweeters such as Sao Paulo and Rio, but in Bogota we still have quite a good number of location based tweets. 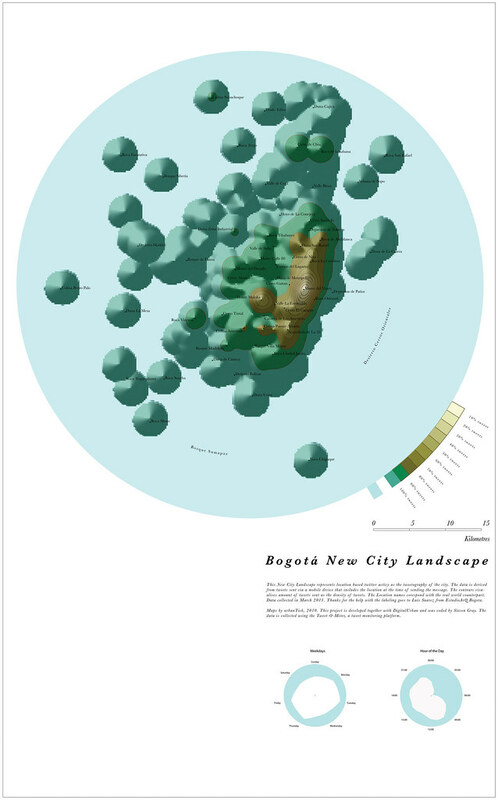 There are about 18% of the tweets geolocated providing a good base for the Bogota New City Landscape Map (NCL). The NCL map is generated as a virtual landscape from geolocated tweets sent from within a 30 km radius of the Bogota area over the period of one week. NCL is an ongoing project and we have covered earlier that can be found through HERE. The striking thing is the extreme cluster tendency in this version of the map. The twitter activity is simply and only concentrated in the business area of the capital along Carrera 7. No wonder this is where things are happening with a lineup of business, shopping and nightlife, where else would you go. This must also be where the money is, since the sample does require the users to use one of the more recent mobile gadgets. Hence the large void to the south and west, where lesser people are using the service. The third large void is defined by the large mountain ridge Cerros Orientales. The landscape feature her as a cut, both on the virtual scape and in the real world. Image by urbanTick for NCL / Bogotá New City Landscape map generated from location based tweets collected over the period of one week. The area covered is within a 30 km radius of Bogotá. In terms of the morphology, even though Bogota NCL features a singular hotspot like the lot of London, Paris, Barcelona it fits more with the feature structure of New York or San Francisco. Especially in term sof how it relate to the physical structure of the city fitting in along this mountain ridge, witch is sort of 1 to 1 reflected in the virtual twitter landscape. The detailed overview of NCL cities from around the world can be found on the NCL World View, with links to the individual interactive versions. Image by urbanTick using the GMap Image Cutter / Bogotá New City Landscape -Use the Google Maps style zoom function in the top right corner to zoom into the map and explore it in detail. Explore areas you know close up and find new locations you have never heard of. Click HERE for a full screen view. The maps were created using our CASA Tweet-O-Meter, in association with DigitalUrban and coded by Steven Gray, this New City Landscape represents location based twitter activity. Thanks for the help with the labeling to Luis Suarez from EstudioArQ.